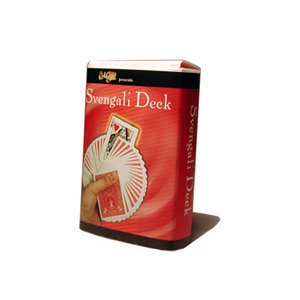 Today, when you order "Svengali Deck by Royal Magic", you'll instantly be emailed a Penguin Magic gift certificate. You can spend it on anything you like at Penguin, just like cash. Just complete your order as normal, and within seconds you'll get an email with your gift certificate. Order in the next 7 hours 43 minutes and it will ship TODAY! The most popular trick deck of all time. 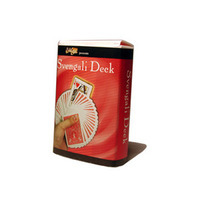 The Svengali Deck is a magic trick deck that should be owned by every single person who does magic out there. 1. A card is freely selected with no force by a spectator. I ask them to show it around as I look away, but I say "Make sure everyone can see that you picked the (their card)." 2. Their card goes back somewhere in the middle of the deck, then rises to the top with a snap of my fingers. 3. Their card is cut back into the middle of the deck, with another snap again rises to the top. 4. Their card is cut into the middle of the deck, I show it is not on top by showing whatever card is on top, snap my fingers, and turn over the top card again showing that their card has now come to the top again. 5. At this point I say some people think I'm using an extra duplicate card, some even think two duplicates, (I cut to show 2 more of their card). 6. Then I reveal every single card in the deck is actually their chosen card. A few people actually forget I showed that all the cards were different in the beginning, and honestly think the previous tricks worked by the cards all being the same card. 7. I then change all the same cards back into completely different playing cards exactly like a normal deck again, explaining that's what you need to show to people if you're going to do card magic for them. The effect of changing the ENTIRE DECK OF CARDS TO THEIR CHOSEN CARD absolutely astonishes people. I CANNOT EMPHASIZE ENOUGH HOW STRONG THAT CARD TRICK IS. This is coming from a magic shop magic trick demonstrator with 7 years of experience too. I know what is strong and amazing, and what is not. Combine your Svengali Deck routine with simply switching the deck for a normal matching one in your pocket at the end to create an absolute masterpiece of magic! I ordered two of these Royal Svengali decks a few days apart (both from Penguin), and they came with two different force cards, so I was very impressed and pleased by that. They also came with some instructions for a few card tricks. These are bridge-sized cards, good for small hands like I have. I just have to say the Svengali deck is by far the most fascinating trick using a gimmicked deck. It is not able to be handed out and checked but as long as there is a great presentation, spectators will freak out.